At Google, we believe that openness is crucial for the future of the Internet. When something gets in the way of the free flow of information, we believe there should be transparency around what that block might be. Fighting online piracy is very important, and we don’t want our search results to direct people to materials that violate copyright laws. So we’ve always responded to copyright removal requests that meet the standards set out in the Digital Millennium Copyright Act(DMCA). At the same time, we want to be transparent about the process so that users and researchers alike understand what kinds of materials have been removed from our search results and why. 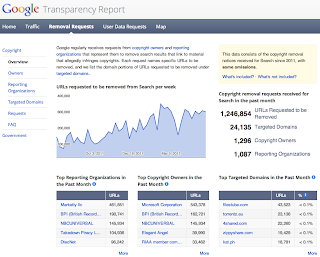 To promote that transparency, we have long shared copies of copyright removal requests with Chilling Effects, a nonprofit organization that collects these notices from Internet users and companies. 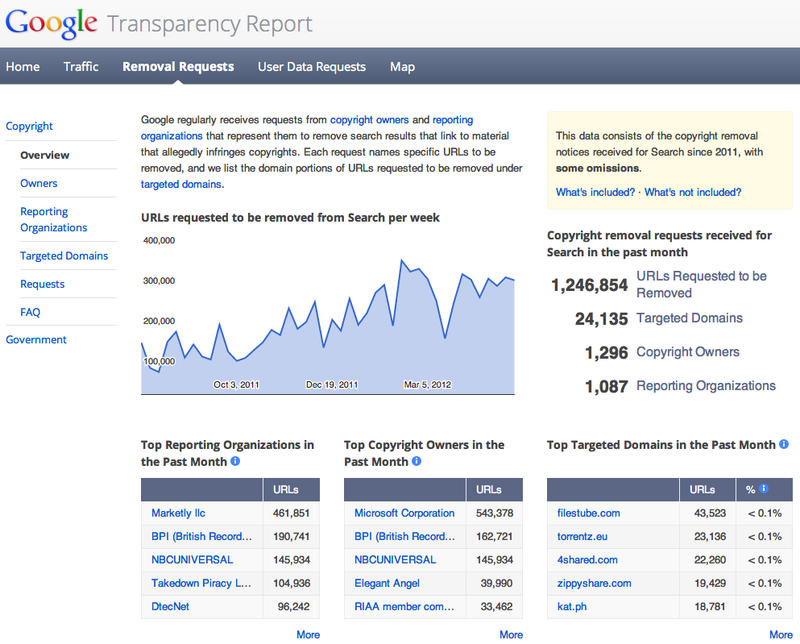 We also include a notice in our search results when items have been removed in response to copyright removal requests. a data visualization competition we’re co-sponsoring with the Guardian Datastore. On May 15, we’ll gather three economic experts—Martha Lane Fox (lastminute.com, Antigone), John Kao (Institute for Large Scale Innovation, Daily Beast), and Larry Elliott (Guardian)—in a Google+ Hangout to discuss ways that the world’s economies might recover from the current recession as well as which countries are creating positive climates for new technologies. The Guardian’s Simon Rogers will chair the Hangout debate. The Hangout be broadcast via Hangouts on Air, which will stream live to Google+ and to YouTube. We want to know what you want to hear our experts talk about! Use the comment field on the Guardian post to let us know! At the end of March, we announced a data visualization competition we’re co-sponsoring with the Guardian Datastore. report. The report examines the various kinds of complaints the FTC gets from consumers on the Internet. One way to think about the report is that it provides us with a key to prioritize actions—government, academia, industry, etc.—in response to risks on the open internet. The complaints included in the Sentinel Network—7 million of them from the period 2007-2011—give a helpful portrait of the online risk landscape. First, we learn that the Internet, with its vast offering, still garners fewer consumer complaints than the old telephone network. For example, in the same period internet complaints were collected, the Do Not Call Registry registered 9 million complaints. Second, the composition of the complaints helps us assess the priorities of consumers on the Internet. 55% of the complaints are about fraud. A total of 1.5 billion USD was reported to have been lost in Internet-related fraud, by the 43% of consumers that reported a loss. If all consumers who experienced a loss had reported fraud, the number could be at least double that figure. These are not small amounts: the median reported loss was around 500 USD, and the average was above 1000 USD. (For comparison it would be interesting to know what average amounts are for offline fraud). Identity theft trails fraud with 15% of complains. Together, these two concerns make up 66% of the complaints in the CSN, suggesting that government resources should be concentrated on these two issues. Third, in 2011, the CSN received 1.8 million complaints in the US. The US had 240 million internet users in 2010, indicating that 0.75% of Internet users reported to the CSN. This suggests that for the vast majority of US Internet users, their 2011 internet experience was a safe one. While this is good news, the 1.5 billion USD lost in fraud is nothing to sneeze at, however, and should be taken very seriously. Fourth, the web at large is not the primary channel for online fraud. Instead, it’s email: of the 60% of complainants that reported how they were first contacted, 43% said email. Only 13% had their initial contact through a website. The real dangers are not the web sites you visit, then, but rather unseemly messages in your inbox. Luckily, many sites have sprung up that allow you to check if the offer that seems to be too good to be true really is. The internet has its share of entrepreneurs and parasites, making trust online extremely important. The reason the Internet can carry e-commerce worth more than 180 Bn USD in the US alone is that consumers trust the network. Finding ways to inform and empower people to have trustworthy relationships matters. Given the findings of the CSN report, any agenda for improving trust should start with addressing email fraud and identity theft, ideally through research that includes crowdsourced data gathering. Eric Davis is a Policy Manager at Google. In February the FTC published their yearly Consumer Sentinel Network report. The report examines the various kinds of complaints the FTC gets from consumers on the Internet. One way to think about the report is that it provides us with a key to prioritize actions—government, academia, industry, etc.—in response to risks on the open internet. The complaints included in the Sentinel Network—7 million of them from the period 2007-2011—give a helpful portrait of the online risk landscape. We must forgive the negotiator or peacekeeper trained in traditional methods for feeling helpless and confused. This is a complex new world for peacebuilding, and one that is in constant flux. As more data becomes available, new insights threaten and even overturn staid assumptions. For example, an August 2011 Fast Company story reports on the US Department of Defense’s plans for the Empirical Studies of Conflict (ESOC) archive, funded by an $8.6 million grant from DoD. ESOC’s mission is to make available to academics previously hard-to-access data on global conflict. Fast Company reports, “ESOC discovered a previously unnoticed—and counterintuitive—correlation between unemployment rates and politically motivated violence,” where higher unemployment was associated with less politically motivated violence. Sanjana Hattouwa's TED talk on citizen journalism. Contentious as it may seem, using data analysis to challenge assumptions and even predict outcomes is a growing trend. For example, The Grill’s computer modeling has been used globally to predict the outcomes of conflict. The PAX initiative “plans to launch a global digital system to give early warning of wars and genocide.” And the non-profit organization Benetech has been contracted by the likes of Amnesty International and Human Rights Watch to address controversial geopolitical issues via data science. Of note, in an exhaustive analysis of over 80 million documents from the secret files of Guatemala’s National Police, Benetech’s scientists employed random sampling to confirm that genocide was committed against the Mayan population during the country’s civil conflict, which lasted from 1960 to 1996. Image analysis is another area with potential data-intensive peacebuilding applications. The LRA Crisis Tracker combines images with a number of sources, including on-the-ground and situation reports from the UN system, to present a temporal and geospatial representation of one of the world’s most brutal terrorist groups in one of the world’s most unstable regions. The visual impact of this representation compels the viewer to investigate the conflict and ways to help, which may lead to meaningful and early intervention in crimes against humanity. All of these early examples hint at data’s potential to meaningfully impact the domain of peacebuilding and peacekeeping, but we cannot simply assume that predictive modeling, random sampling, and other “Big Data” applications are automatic, easy solutions. Figuring out how to effectively leverage massive amounts of data to save lives and build peace is going to be a challenge—but it is one worth taking on. Sanjana Hattotuwa is a TED Fellow and Special Advisor with the ICT4Peace Foundation. The very nature of peace negotiations has fundamentally changed. Once an art involving a select few and practiced behind closed doors, negotiations are now broader social conversations that include the voices of diaspora. Except for cases of the most draconian censorship, high-level stakeholders in peace negotiations have very little control over this social hubbub, out of which vital concerns, critiques, ideas, and alternatives can emerge. Indeed, the very agenda of official negotiations can now be contested and debated in real time on the web. Thanks to reams of official texts, a plethora of social media updates, and mainstream media coverage, today’s peacebuilding and peacekeeping efforts generate, respond to, and are informed by massive amounts of data. , which spotlights innovators of all shapes and sizes and gives them an opportunity to tell their stories. Our next episode features Art Neill, the founder of New Media Rights, a nonprofit that helps artists and entrepreneurs navigate the complex legal thicket around creating art and media online. To set the context for why this is important, you might also read John Tehranian’s Infringement Nation. Tehranian explores how, without committing anything close to copyright piracy, you might find yourself in a legal grey area when you create content online. We’re back with another edition of our Jack and Jill the Innovator video series, which spotlights innovators of all shapes and sizes and gives them an opportunity to tell their stories.